Do you know the secret of making a tasty and tantalizing Creme Brulee or other specialty dishes? The answer is fairly straight; you need the best cooking torch. We have spent several hours researching and editing in order to provide you with in-depth cooking torch reviews. A high-quality cooking torch can help you whip up a mean Creme Brulee, sear meats or even prepare flaming cocktails. 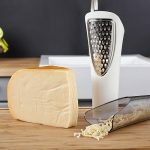 This small kitchen tool can allow you to make these delicacies just like you see the professionals do in your most loved show. 2.1 Is The Torch User-Friendly? 2.6 A Propane, MAPP or Butane Torch? 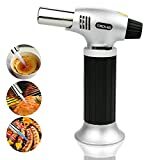 Now that you know what constitutes the best torch for culinary uses, you can agree with us that the following kitchen cooking torches are among the best. 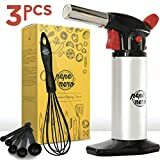 If you want a perfect cooking torch to help you make professional culinary masterpieces such as Crème Brulee, perfectly seared meats and gratins and meringues then look for Pepe Nero Refillable Chef’s Torch. This tool features an ergonomic handle that is either black or silver. The handle is comfortable allowing you to use the torch for extended periods without hand fatigue. While the handle is not rubber padded, the material used is very easy on your hands and provides tight anti-slip grip. Pepe Nero is very easy to use. It features an easy push-button ignition. It’s lightweight and compact design makes it easy to handle by almost every adult family member. A safety lock is included to prevent unnecessary ignition which can easily lead to fire accidents. The torch meets child-safety requirements. The adjustability of the flame is a great feature of the Pepe Nero. It allows users to control the gas flow rate and therefore the strength of the flame. 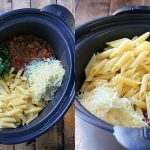 Such versatility allows you to use the torch for a variety of culinary needs all with perfect results. For instance, the torch is ideal for glazing, toasting breadcrumbs, flash searing a piece of fish and browning the top of meringues and tart among others. The JB Chef Culinary Micro Butane torch is among the smallest and sturdiest food torches in the market. At 5.1 x 3 x 7 inches, it is lightweight (8 ounces) yet highly effective. It is made from high-quality materials to guarantee a long life. The white/silver color greatly enhances the kitchen decor. This mini blowtorch is very easy to use with a base stand that makes possible hand free use. When it comes to handling, the tool features a comfortable and ergonomic handle with a perfect fit. You can use it for hours without feeling any fatigue in your hand. When the gas level reduces, the torch is very easy to refill. You do it when the device is standing on base on the tabletop. Refilling is with the lighter butane, a process that will take only a few minutes. The torch features a flame adjustment that allows you to choose the ideal intensity depending on what you intend to cook. It is wonderfully constructed to guarantee durability. Construction is from high-quality materials that are resistant to wear and tear. To give you full confidence on the torch, JB offers an unconditional money back guarantee and free replacement should you find fault with the one you buy. JB Chef Torch blazer features a locking mechanism to ensure it is safe with every use. 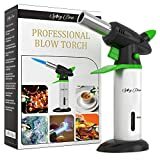 Choose to buy Spicy Dew Professional Blow Torch if you intend to create delicious, mouthwatering dishes of restaurant standard. This engineering marvel features an ergonomic design that allows you to work for hours without hand fatigue. It is a perfect choice for caramelizing sugar on top of Creme Brulee, roasting bell peppers, searing meats, melting cheese and so on. Spicy Dew blow torch is multipurpose. The great portability of this torch makes it a prime choice if you wish to use it indoors or even outdoors. 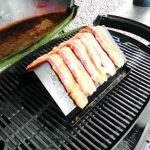 You can even use it to light barbecues, candles, and fireplaces. Due to its high burning temperatures, you can use the torch for dabbing, welding, soldering, plumbing, jewelry making and camping among other outdoor activities. Its instant flame can burn up to 2372 degrees F for up to one hour before requiring refilling with butane. The refilling itself is very easy and fast, especially with its stable tabletop base. You can regulate the intensity of the flame by using the gas flow adjustment feature on the torch. When it comes to safety, Spicy Dew included a number of features to ensure you are safe when using the tool. The handle is comfortable to hold and the grip is tight. The torch cannot fall out of your hand. Another safety feature is the anti-flare technology. It also comes with child-safety lock. A hand protection guard is available to shield you from the heat of the burning gas. The instant flame burns at about 2373 degrees F.
The Jo Chef Professional Kitchen torch is a great choice if you want to be the master of your kitchen. Despite its great performance, you do not really need to be a skilled cook in order to make tasty and mouthwatering dishes for your family and loved ones. 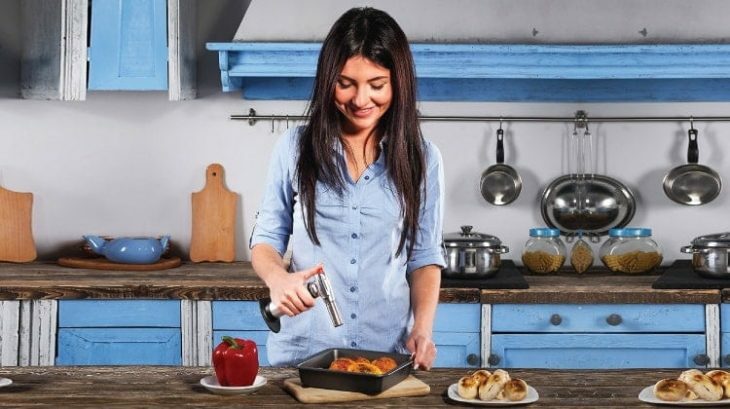 This torch will allow you to create irresistible meals and even experiment with various food preparation techniques. You do not have to worry about damaging your torch because the Jo Chef is constructed from high-quality materials to resist heavy use. The body is constructed with high-quality aluminum. In terms of safety, Jo Chef is at the forefront. This culinary torch has been put through thorough third-party testing. The aim is to ensure the blazer meets the set standards for safety. It comes fitted with a child safety lock and flame adjustment knob. The latter feature allows you to control the intensity of the flame. 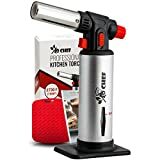 Besides the culinary purposes, you can use the Jo Chef Professional Torch to complete a number of DIY projects around the house including plumbing and welding. Such versatility is a reliable mark of high quality. Iwatani PRO2 Cooking torch lets you make your favorite dishes. Whether you want to make pastries, Crème Brulee or sous vide, PRO2 is a perfect choice. Although it is a little bit more expensive than the other brands we have so far reviewed, its quality makes it worthy of such a price. One of the lovely attributes of this butane torch is its ease of use. It allows for flame adjustment in terms of shape and size in order to concentrate the flame as little or as much as is necessary. This feature gives you the flexibility to a variety of delicious dishes. Another feature that makes the torch easy to use is the one-touch piezo ignition. This guarantees quick and easy startup. For the safety of use and easy handling, the torch has a stabilizing plate that allows it to stand on your tabletop. The butane canister is easily removable. In other words, Iwatani Pro2 is not a refill torch. If the gas is finished, you simply need to replace it with a new butane canister filled with the gas. Thus it allows you to escape the fuss and muss associated with a refill. Its ultra-high power 6300BTU unit is able to deliver much higher temperatures peaking at 2700 degrees F compared to conventional culinary torches. Such performance when added to its stainless steel construction gives PRO2 unmatchable efficiency and performance. Are you in need of a professional culinary torch that is suitable for both professional and home use? 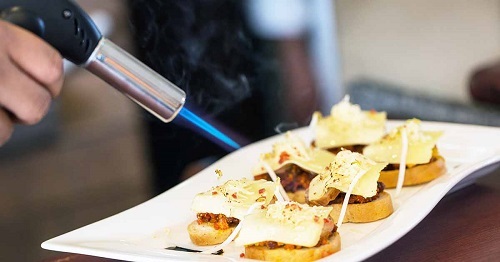 The cooking butane torch from EurKitchen is a suitable choice. It features an ergonomic aluminum and ABS plastic construction that is durable yet lightweight. These design attributes make the torch ideal for many uses in both professional and home settings. The torch is equipped with a burn-free finger/hand-guard that helps to prevent unintentional burns when the torch is operating. There is also a gas flow safety lock to stop accidental lighting before it can wreak havoc in your kitchen. Such features aim to protect your family and loved ones from accidental fires. A gas flow regulator dial is designed to easily adjust for up to six inches of continuous flame and temperatures of up to 2370 degrees Fahrenheit. The high temperatures will be at your disposal in an instant with a simple auto-piezo ignition. Inasmuch as the torch comes without gas for safety reasons, you can easily fill the canister with any brand of butane readily available at your local store. Refilling is quick and easy. A stabilizing base ensures that refilling your canister is without any issues. 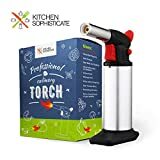 Kitchen Sophisticate provides you with a multipurpose butane torch that you can use for various culinary and DIY projects. The tasks you can achieve with the torch include searing meat, brazing vegetables, or to caramelizing desserts in your kitchen. Alternatively, you can use it outdoors for a barbecue. Adjustability is an important feature both for versatility and performance. Kitchen Sophisticate cooking torch features a gas flow adjuster that lets you regulate the strength of the flame. There is also a safety lock to prevent unintentional ignition. That should be great news because it guarantees the safety of your family and pets. This searing torch is engineered with a broad, stable base that makes hands-free use possible. 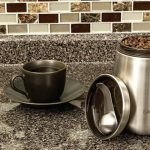 The cylinder body is easy to grip and will not slide off your hand to cause chaos in your kitchen. The trigger is comfortable and ergonomic for consistent and safe use. These features make Kitchen Sophisticate culinary torch highly versatile with expanded use to include camping, soldering or making survival fires. As with other great culinary torches, this one also takes serious issues of child safety. It is fitted with child-resistant safety lock. This makes it impossible for your young champs to play with fire and get burned. 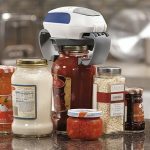 A culinary torch that features all the latest features is the one that will allow you to work in confidence well aware that your kids are free of any dangers. This is because it is equipped with a number of safety features that are not common with conventional models. The safety features include a safety lock, a hand protection plate, a flame guard and fully attached base. The lock ensures that the torch cannot light accidentally. The hand-protection plate, on the other hand, helps guard your hands against the intense heat of the flame while the flame guard prevents the flame from dangerously flaring. Other culinary torches have bases but such bases are detachable. This presents many challenges including instability and the risk of toppling over. Ingeniosity Products deviates from this norm and fits their culinary torch with a permanently attached base. Thus you can set it down securely and then let it cool safely. This torch is very easy to refill. To refill, ensure you turn off the gas flow regulator and ensure the safety lock is engaged. The process is easy and direct and will take you just a few seconds and you will be free to continue with your work in the kitchen. Become a professional chef right in your kitchen by buying this culinary torch. This elegant piece of engineering is great for caramelizing sugars, Creme Brulee, glaze ham, sear a steak, melt chocolate or cheese, crisp or toast and various other recipes. The torch achieves this versatility because of superior quality design. It features reinforced non-slip grip handle made of high-quality aluminum and a stainless steel nozzle. The refill canister is also high quality with a capacity of 28 liters. That is capable of one-hour burn-time before a refill. The powerful flame burns to a maximum of 2700 degree Fahrenheit for quick wok on your culinary projects. Safety is a major concern with cooking torches. Luckily, this Culinary Creme Brulee torch has a number of safety features making it user-friendly. These features include simple safety lock with the so-called precision-flame technology. An anti-flare feature is meant to keep you safe while the high power flame touches your target. Another great feature you will find in this torch is the instant on and off-gas seal. This lets you operate the torch without any risk of butane leak. Further leak prevention comes from the presence of a refill valve which also makes refueling an effortless task. The powerful flame burns up to 2700 degrees F.
Featuring a smart and stylish design, the TedGem Culinary torch is among the best cooking torches currently in the market. 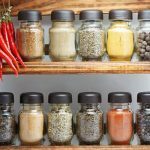 Its professional quality construction makes it ideal for use in the home kitchen or restaurant with the same reliable performance. It will help you make your delicious dessert brazing camping, Creme Brulee, barbecue and baking. A nice feature you will love about this torch is flame adjustability. This allows you to control and therefore customize the anti-flare flame to match your desires. Its maximum temperatures can reach to 2500 degrees Fahrenheit to meet a variety of needs. In fact, the flame adjuster lets you choose different flames according to what you are cooking. Further control comes from the gas flow regulator and the air-flow control valve. TedGem Searing torch is equipped with a security lock which prevents unintended ignition that could lead to fire accidents. Besides excellent safety, the torch is very easy to use. Simply slide the safety lock to off position and turn the flame knob until you perceive the gas is flowing. You can then start the flame by pressing the one-touch ignition button. This torch is made of high-quality aluminum alloy which ensures durable service. The torch’s continuous burn option enables extended use with minimal effort. Unlike the common cooking torches, this unit features a fuel gauge window to let you know when a refill is necessary. It achieves maximum temperatures of up to 2500 degrees F.
Choosing an ideal torch for you cooking may not be an easy task especially given a large number of brands and models currently available in the market. Nevertheless, a few guidelines and tips can go a long way in helping you narrow your choices. 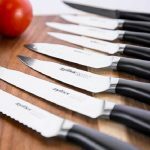 Before we delve further into reviewing our top 10 best cooking torches, let’s educate ourselves on the most important considerations necessary for an informed choice. Sophistication does not always mean a product is of high quality. Instead, a great quality product should be easy to use. A sophisticated torch is cumbersome to use. Trying to figure out just how the tool works may consume your time. But even if it works, you may not know how to deal with any complications that may arise. Buy a high quality but easy to use a cooking torch. Cooking torches come in many different shapes and sizes. The ideal size for you should be a personal decision. However, the lighter and smaller the tool the better it will be for extended use. A heavy one will increase the chances of hand fatigue as you work. Choose one that feels comfortable in your hand when you hold it. A rubber grip on the handle is always comfortable and forgiving. Some torches feature tabletop stands. This means you can use them hands-free. Such an alternative is great if you have a problem gripping things properly. It is not possible to know the performance of any product without testing it. The same applies to the performance and efficacy of a cooking torch. A good quality kitchen torch should be fast and effective. It should be able to achieve a minimum temperature of 2500 degrees F.
If the temperature is less than that, the flame may not even be able to crisp the top of Creme Brulee. Most handheld torches have a label indicating the minimum temperature they are able to achieve. It may be necessary to go further than just reading the label. Test the tool to see if it can achieve the appropriate temperature. The rate at which gas flows from the canister of the torch determines the size of and shape of flame it propels. The quality of the flame is also controlled by the gas flow rate. One of the greatest features a cooking torch should have is gas flow adjustment. It allows you to control the size of the flame to suit what you are making. The best flame should be narrow, short and dark blue on color. A bigger flame is not only ineffective but also dangerous. A large flame can easily lead to a fire accident. Cooking torches produce strong flames that can be dangerous to everyone, especially children. Therefore, there are federal requirements to ensure child safety. Make sure you choose a brand or model that meets child-safety requirements. It should also have a safety lock. Your butane food torch should also have a long anti-fare neck which not only adds to safety but also improves the precision of the flame. A long anti-flare neck also ensures the torch will work optimally at any angle. A Propane, MAPP or Butane Torch? Kitchen torches are fueled by either propane or butane gas. However, some brands also use MAPP (methylacetylene-propadiene propane) made by the Linde Group is oxyacetylene. MAPP is based on a stabilized mixture of propadiene and methyl acetylene. Propane and butane are the most commonly used gases for torches but MAPP produces a much hotter flame. MAPP can achieve flame temperatures of up to 3650 degrees Fahrenheit. This may be advantageous for culinary uses. The disadvantage is that the gas is very expensive. If you do not need too much heat, then choose propane or butane fueled cooking torch. We realize that not everyone is conversant with this kitchen appliance. 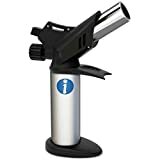 Also known as butane cooking torch, this is a culinary tool designed to create an intensely hot flame using a flammable gas called butane or propane. The flame can heat to 2500 degrees Fahrenheit. That flame is strong enough to melt crystals of sugar sprinkled on a clustered to create a delicious bitter/sweet tough layer of caramel. Thus the torch is versatile and highly useful in the culinary world. The tool uses a mechanism similar to that of pipe cigar lighter. It works by keeping a consistent stream of thin air that burns into a torch. Kitchen butane torches are very easy to light. Each has a refillable mini fuel tank. Is it Safe to Use a Regular Torch for Food? No, it is not safe. This is contraindicated because regular torches are more powerful and therefore have increased chances of fires. Besides, complex molecules emanating from heating the food itself with such powerful torch can be harmful to your health. How Do I Refill My Butane Culinary Torch? The process is pretty simple. First, you have to make sure the torch is off before anything. You can then turn the torch upside down in order to locate the refill nozzle. Hold the butane can in precise alignment with the nozzle and the torch. Dislodge the can of butane after the torch’s canister is full to capacity. Tarry for approximately 4 minutes before you ignite the torch again. Why Are Cooking Torches Sold Exclusive Of Gas? The simple answer to this question is safety. A lot happens during transportation and handling. Cooking torches use flammable gases which can leak with poor handling to cause accidental fires. Butane gas is readily available for refilling. Propane gas refills are readily available in many local hardware stores. If still in doubt, carry out a little online research to find out local distributes. You can even buy one online. 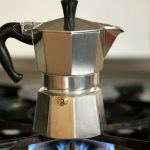 Is Butane Or Propane Gas Dangerous? Yes, these gases can be dangerous if inhaled. For instance, researchers have associated butane with neurological impairment and heart problems. That is why you need a superior quality cooking torch to ensure it is leak-proof. There you go. We hope you are now well-equipped with enough information to venture out for a shopping session. As you can see our top 10 best cooking torch reviews have tried to capture all the important features of these great kitchen appliances. You can cross-check to see for yourself and make the right decision. We also understand the differences in tastes and preferences. The good news is that you can use our in-depth buying guide to make an informed choice. Each of the products in the review has excellent ratings because of their efficiency, comfort, ease of use and safety among other great features. Hopefully, you have found this resource helpful.